Arum lily (lilies) are found from Europe through to Northern Africa. 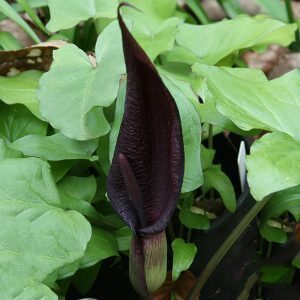 Arum italicum is probably the best known however Arum palestinum is an excellent dark purple flowering garden species. Arum pictum is autumn flowering, Arum rupicola is a taller growing species. Arum dioscordis is a rather dramatic species large spathes spotted with purple and a long dark maroon spadix. Probably better in a part shaded position. The flower itself has an unpleasant smell, so grow it away from the house. Arum pictum with its reddish maroon spathe and a deep purple spadix, sought after varieties have attractive silvery veined green foliage although some seem to be plain green. A. palaestinum is rare in cultivation, Originally from Syria, Palestine and Israel. Deep velvet black flowers and a contrasting mid ‘apple green’ foliage. A. orientale has green and purple flowers. A. purureospathum is originally from Crete. A large very deep coloured red to black spathe and foliage margined with purple. The spathe rises high above the foliage. Best in full sun to part afternoon shade. A.hygrophilum is a water loving species, white flowers magdined with red to purple, sometimes called the stream bank lily. Arums do best in a humus rich well drained position in full sun. Mulch well to retain moisture. Seed heads will form after the flowers and will ripen a brilliant red. In warmer climates, some afternoon shade will improve the life of the flowers. To prevent self seeding snip these off as they appear. Or collect when ripe and propagate them.